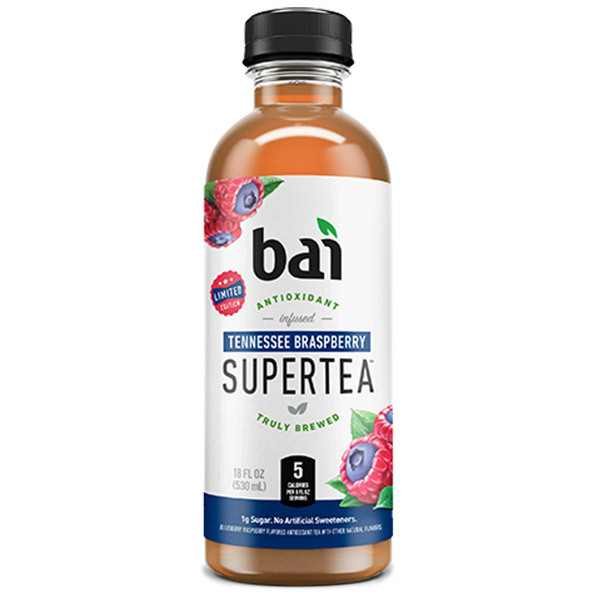 Tennessee Braspberry Tea is rated 4.4 out of 5 by 7. You know that scene in every movie when the hero proposes some insane plan, where if even one move goes wrong, everything is probably going to blow up? That’s how we felt when Justin Timberlake said he was going to put blueberries into raspberries. But he did it. So we did our part to put this fruit fusion he calls braspberry into a tea with only 5 calories and 1g of sugar per serving. What Goes Into A Braspberry? The fusing of this remarkable new fruit is a delicate task, not to be undertaken by the faint of heart. It requires expert timing, years of dedicated training, and an unwavering belief in the power of berries. Pick a clean, smooth surface on which to assemble the braspberries. A granite, marble, or stainless steel countertop is recommended. If no clean surface is available, take your tool kit to someone’s house who’s successfully adulting and continue assembly there. Divide the blueberries and raspberries into two separate piles. Make sure there is enough distance between each pile so the berries develop a longing for one another, but close enough together that they don’t get separation anxiety. Give the berries an inspiring speech about teamwork and remind them that the following feat will require expert timing and precision. Gently pinch the bottom of the raspberry between your thumb and pointer finger. Be careful to only apply light pressure. Take a toothpick and gently inform the blueberries they may feel a slight pinch on the count of three. Carefully insert the toothpick into anterior face of the blueberry. Lift it up and inspect it for imperfections. Just don’t make it feel self-conscious. Take a deep breath. Like way deeper than you would think necessary, and hold it as you begin the insertion process. Go slow. This is a delicate dance that requires a deft and skilled hand. Like docking a space shuttle or retrieving your phone from the car when you drop it in that little crack between your seat and the center console. Slowly draw out the toothpick from your freshly combined berry. If at any time you feel your berry beginning to break apart, don’t panic. Simply step away, quickly binge watch an entire season of a show you’ve already seen, and then return to try again. Marvel at the creation you have breathed life into. Shout from the rooftops that you are a benevolent berry overlord! And then eat your creation. They’re delicious. What else were you going to do, just let it sit there? What’s wrong with you? Filtered water, erythritol (natural sweetener), juice concentrates (blueberry, strawberry, blackberry), natural flavors, organic coffeefruit, malic acid, fruit and vegetable juice for color, organic stevia extract, white tea extract. Rated 5 out of 5 by Texas from Mind blowing and delicious, have yo momma cryen.. I had this drink week ago then I bought it again yesterday,I can't wait to get a bigger check soon so I'll be able to enjoy Bai thank you for giving us such a wonderful taste and drink.Bai Baby yeah.. Rated 5 out of 5 by susand81 from Love The Title especially as I live in Tennessee I bought the Tennessee Braspberry Flavor on Amazon Prime Day and LOVE IT! Noticed it said limited edition so tried to order it again but it's already not available. I normally purchase the coconut variety pack and love it, but the TN Braspberry is my new favorite. These are super refreshing and full of flavor, not too sweet at all. I've been staying away from coke type products and this satisfies me. And only 5 calories! Rated 5 out of 5 by CareyC from Genius! What a great combo! So excited to try this! Glad to see the chief flavor officer doing his job! Rated 5 out of 5 by Clight83 from I'll eat anything Justin starts Try me!! #braspberry I'm excited for this tea. And Bai is so smart!! Rated 3 out of 5 by SamIAm from Hold up! There’s no actual raspberry in this bRASPBERRY drink?! All this after I JUST mastered the tutorial. I need a moment to process.